Decorate your daybed or patio furniture with these Blazing Needles solid color throw pillows. The bold color options provide a decorative accent to patio furniture, while the soft polyester fill and cover material offer comfort. This set includes 1 rectangular back support pillow and 2 square accent pillows. 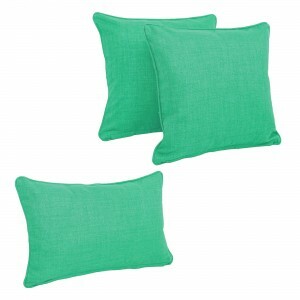 With corded edging for style and removable inserts for easy care, these pillows are comfortable additions to any space.